Hand tattoos for men are one of those interesting tattoo types for many reasons. But the most important is that it will always be visible very well. The visibility is probably the main reason, why many men choose to ink their hand or hands. However, a well visible tattoo is not always very favorable, and in some cases, it can be bad for you. In this article, we will go through main advantages and disadvantages of hand tattoos for men. And of course, we will introduce you to a fantastic hand tattoo collection. Traditional heart tattoo on the hand. Circular dots tattoo on the right hand. Hand tattoos for men – are there any disadvantages? As we’ve already mentioned, the most significant disadvantage and advantage at the same time is the visibility. There are sectors where the work ethics still require that employees would not have a tattoo on a visible place, for example, hands. If you’re planning your career in some big company, you should carefully think before deciding to ink your hands. Wolf and tiger tattoo on the hands by tattooist Toni Donaire. Traditional rose tattoos on both hands by Mark Cross. Church tattoo on the hand. But that is probably it. Apart from the fact that you might encounter some problems at work, hand tattoos are an excellent place to ink. So putting this one small disadvantage aside, let’s take a more in-depth look at hand tattoos. You will see how can they become true artworks! Traditional butterfly and mandala tattoos on hands. Skull tattoo on the hand. Pirate head tattoo on the hand. Hand tattoos for men – what are the most popular designs? Hand tattoo popularity rose at the beginning of the 20th century. To identify themselves from the others, prisoners started to mark their hands with various symbols. Of course, the origin of hand tattoos is much older. But we won’t dig into that because it needs a different study. Traditional blackwork tattoo on the hand. Hell bent tattoo on the hand. Grim reaper tattoo on the hand. 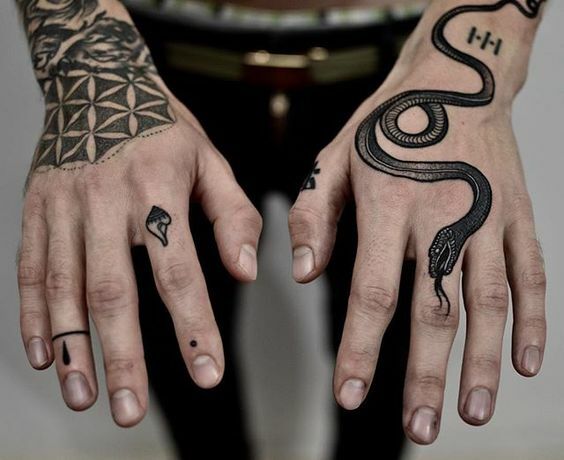 Generally, hand tattoos are more popular among the men than the women. Although the popularity of hand tattoos for women are increasing, it remains a more manly thing. Traditional rose hand tattoo for guys. Spiked mace tattoo on the hand. Dotwork mandala tattoo on the right hand. While women prefer more delicate and elegant tattoos, men like to get more difficult tats. But more and more men get small and minimal tattoos. Most common hand tattoo designs for men are skulls and other traditional styles. Also animals, quotes, and symbols. Mandala tattoos are another cool design both for men and women. Since your tattoo will be well visible, don’t get a name tattoo. You know how breakups can hurt. So you will not be pleased when you’ll have to see it for the rest of your life. Red mandala tattoo on the hand. Classic flower tattoo on the hand. Leaves tattoo on both hands. The internet is full of tattoo ideas. It’s sometimes hard to pick a design when you see lots of them. It is important to remember that there’s no rush. If you find an idea that you like, but you’re not sure about it, wait. Keep looking, and you will discover the best variant. Many men prefer difficult tattoos more than minimal and small designs. But if it’s going to be your first tattoo, we advise you to look into simpler examples. They look great, and you will always have the chance to make something more from it. White snake tattoo on the hand. Traditional coloring mandala tattoo on the hand. Solid black mandala tattoo on the hand for guys. Exquisite detailing on this perfect mandala tattoo on the hand. Rocket tattoo on the hand. Gorgeous swallow tattoos on the hands. Sacred geometry and black lines tattoo on the hand. Solar system tattoo on the hand by tattooist Dr. Woo. Snake tattoo on the hand. 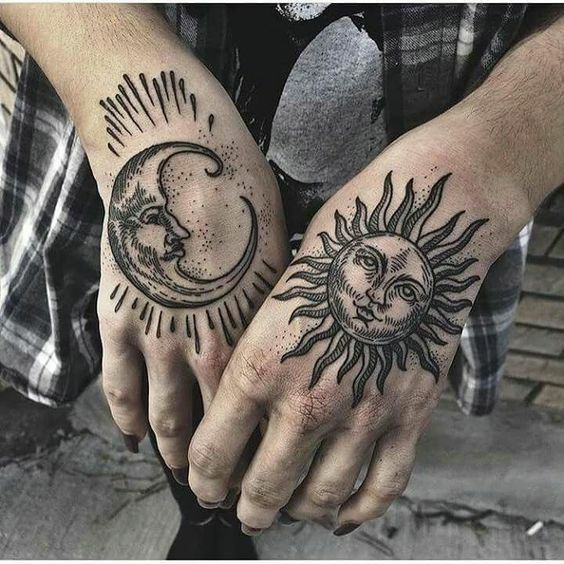 Sun and moon tattoo on both hands. Hand tattoo idea by Noelle Longhaul. Snake tattoos on both hands. Mayan pattern tattoo on the hand. Small Rose Tattoo On The Right Hand. Cool blackwork hand tattoo idea. Traditional Croatian pattern tattoo on the hand. Traditional style swallows tattoo on the hand. Tribal tattoo on the hand. Butterfly and crescent moon tattoo on the hand. Black mandala tattoo on the hand. Simple small rose tattoo on the hand. Black flower tattoo on the hand. Another classic swallow tattoo on the right hand. Chevron tattoo on the hand. Black wolf tattoo on the right hand. 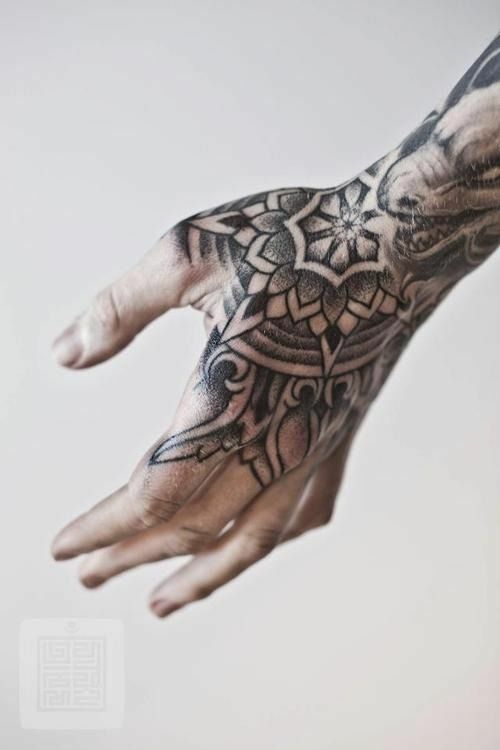 Another excellent hand tattoo for men – a blackwork mandala. Anchor tattoo on the hand by Timur Lysenko. Another cool blackwork hand tattoo by Guy Le Tattooer. Tiny Black Cross Tattoo On The Hand.